Rusts are types of plant diseases that are caused by a fungus in the Pucciniales order. These diseases affect plants and flowers, and gardeners will notice the telltale signs of speckled masses that surface on the leaves. Some of these rust diseases have a reddish-orange color like the name suggests, but there are many other colors as well, including purple, black, red and yellow. Rust appears in freckle-like spots, and there may be just a few spots or hundreds depending on how serious the disease has become. 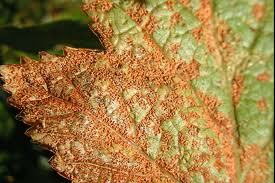 Rust fungi is a biotrophic, meaning that it grows within the living tissues of the plants. While the fungus generally does not kill the tissues, it affects the plant’s growth and maturity. This disease is most common in the late summer or early fall when there are humid temperatures and moist conditions. What Types of Flowers are Affected by Rust? Hollyhock flowers are the most common victims of rust, but there are other flowers that are vulnerable as well. The aster, carnation, geranium, iris, lily, pansy, primrose, snapdragon, sunflower and sweet pea are all flowers to keep an eye out for. With many types of fungus, it’s common for vulnerable plants and trees to be affected, but rust affects healthy plants, taking gardeners by surprise. In fact, it’s healthy, fast-growing plants that are most at risk, and this is what makes rust attack the plant parts, including the leaves, stem, fruit and tender shoots. There is another type of rust fungus – white rust – that affects only chrysanthemums. This type of rust acts like the other rust disease and leaves behind pale yellow spots on the leaf surface. These speckles can become bumpy and brown over time, and the plants definitely become stunted. How Do I Identify Rust? Freckled spots or speckled masses are staple signs of rust, especially when you see them in reddish-brown or orange colors. When a heavy infestation occurs, you may also notice the leaves on the plant curling and wilting. Some plants will wither and die back while others will experience stunted growth. Severe infestations may also leave a plant looking yellow and discolored. Rust does not generally kill the plant, and it helps that the plant is likely to be healthy and growing. The most devastating effects are that the plant will have stunted growth and yield far fewer fruits than if it wasn’t affected by rust. What Can I Do if my Plants Have Rust on the Leaves? If you notice signs of rust, don’t think that you’ve done anything wrong. The fungus travels through wind, water and insects, allowing the fungus to travel. It attacks healthy plants, so an infected plant does not mean that it’s unhealthy or vulnerable to other parasites and infection. The best step you can take is to stop overhead watering. Fungus thrives in wet, moist conditions, and by watering your flowers overhead, you will contribute to the fungus’ growth. It’s best to install a drip irrigation system that will disperse water regularly from the ground level, penetrating the roots instead of hitting the leaves. Even though drip irrigation systems are well worth the initial cost and can save money on utility bills, we understand that these systems are still an investment. If this type of system is not realistic, do the smart, simple steps of watering your flowers in the early morning when the plants have the rest of the day to dry. Also be sure to care for your plants’ health by removing affected foliage. By doing this, you’re preventing the spores from spreading. Sometimes, more invasive measures are needed, so call in a professional arborist who can apply a fungicide treatment that will reduce and eliminate the infestation without harming your plants. You may also aim to play rust-resistant flowers in your garden such as the rugosa rose or Rocket series snapdragons.